Nuance on Wednesday announced the launch of Dragon Dictate for Mac 3, the latest generation of its much-loved voice transcription software. 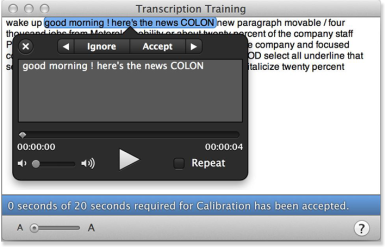 Dragon Dictate 3 can be trained to recognize a user's speech patterns, and transcribe accordingly. The revamped software is the first update to Dragon Dictate since July’s Mountain Lion debut—which included the introduction of a basic underlying dictation service of its own. But Dragon Dictate still offers advantages to Mac users, most notably its availability for offline use, as well as a customizability that allows the software to recognize and transcribe a user’s personal, idiosyncratic speech patterns. Nuance says that the latest version of Dragon Dictate is more powerful than its predecessors, offering a 15 percent improvement in transcription accuracy. And Nuance has piled on more options to improve that accuracy, with the addition of “Smart Format Rules” that allow the software to recognize when a speaker is using abbreviations and numbers, along with an “Express Editor” that lets users speak the text they desire—then quickly paste that text into a document in a different app. Dragon Dictate 3 also offers support for 16kHz wideband Bluetooth wireless headset microphones. And the software will also transcribe speech recorded on a separate device, such as an iPhone or more traditional digital voice recorder, if given access to the audio file. Downloads of the app will be available from the Nuance website starting Sept. 13; boxed copies of the software ship Sept. 24. Dragon Dictate for Mac 3 costs $200 for new customers; existing users of Dragon Dictate can upgrade for $150.